On Sunday, September 9th, get ready to be driven by the luring punch lines and rhythm of good music from Dr. barz, as he performs live at the #BehindBarz concert along side other amazing musical acts at Exodus Cafe, G.R.A Port-Harcourt. 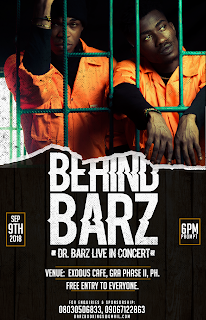 The show would take the audience on a roller coaster ride around the enchanting performance of Dr. Barz, Dan dizzy, Ajebo Hustlers, and many more. #BehindBarz promises to make history in the city of port harcourt as, it is aimed at promoting peace and non-violence, in conjunction with the #PunchLinesNotPeople­ campaign. Amazingly with its sweetness, #BehindBarz promises to be completly free of charge, with no gate fee attached to it. So get your gears up and your swag steaming, this Sunday Sept. 9th by 6PM, as we prepare to hit the high way to Exodus Cafe, No 2 Chief Ede Close Off Sani Abacha Road GRA PHASE 2 Port Harcourt. Trust me, #behindbarz is where you want to be this weekend. This event is proudly supported by : Vechilz NG, Barry Presh Blog, Creatives Hub, Adure TV, Gbetu Tv, Magma Tech, Air music, Picturesque, VNGO, Briel Concept, 818TV, Karina Blog, 22zero Spot, KampusTV, Wave FM, Soundcity FM, Beat FM, Wish FM, Raypower FM, Rhythm FM, Naija FM, Treasure FM, Peejay 247TV, iGist360, Oba Photography, Ukwubenda, PHCityPromo, Wildshotz, Kaye Visuals, The Fish Imagez, PhotHarcourt.